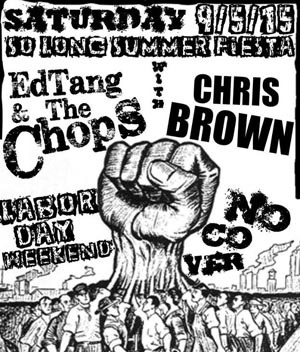 It will be anchors away for the shore area’s Ed Tang and The Chops Saturday night in Asbury Park- it will be Tang’s final local performance for some time because he is leaving on a Navy assignment in California. As an active-duty Navy logistics officer, Tang, 33, is being stationed at Monterey for more than a year. “People should come out and see us one last time. Our shows are usually pretty wild events and this will be one last hurrah,” he said earlier this week. “The band is like Bruce Springsteen meets the Bouncing Souls. It’s a really good band and I am sorry to see Ed go. This band has really been one of the brightest lights at the Jersey Shore for the past two or three years,” said entertainment director Peter Mantas. The farewell concert will be this Saturday, Sept. 5 at the Asbury Park Yacht Club, 1000 Ocean Avenue, on the boardwalk. Admission is free. Show starts at 9 p.m. with special guest Chris Brown. And while Tang, a Belmar native, said he is leaving for military duty, he is taking the Jersey Shore with him wherever he goes. “I feel like I will never leave it and I will always be coming back to friends and family. I look forward to traveling and doing my job for a while but I know I will always be back,” he said. Tang’s fellow band members will remain behind and move on with their own musical careers. The Chops, who have been together for more than three years, are Tang (vocals/guitar), Nick Bock (bass), Vic Fraternale (keyboard, harmonica, vocals), Brad Harrison (drums, percussion), and Geoffrey Myers (lead guitar). “It’s a nice breaking point for as. Myers and Fraternale are both incredible songwriters in their own right and I am happy they played with me. They will go off and do some of their own solo music and look to record,” he said. Asbury Park has always been a favorite base for the band and they rehearse in the well-known Hot Dog House on Cookman Avenue, near Main Street. “Asbury Park is an amazing hotbed of creativity. I have been to a lot of places, especially being in the military, but I have seen no place that nurtures original music like Asbury Park. It’s all types of music and you have to be good to make your name in the Asbury Park scene,” he said. Ed Tang and The Chops is headed into the studio before Tang leaves to record one last album. Previous releases include the recent “Ed Tang & The Chops” and Tang’s solo “Goodbye, Zen5, Sushi Dinner” in 2013.